Consider a garden: the bright colors and cool pastels of the flowers look even better against the rich green foliage. Perhaps this is why the rich green of chrome diopside looks so fresh with all the flower tones of your wardrobe. In Siberia, there isn't much green to admire for most of the year. Perhaps in compensation, nature placed rich deposits of a vivid green chrome diopside in this snowy region to delight the eye during the long and hard winter months. This challenging landscape is home to the world's major deposit of chrome diopside, a diopside gem variety that is colored by chromium, the important element that also gives emerald its rich green color. Chrome diopside is mined in a remote location in Eastern Siberia known as Inagli in the state of Sakha. The area is better known for its impressive diamond deposits. 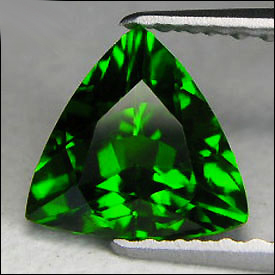 Gems with an attractive pure green color are generally rare and pricey. 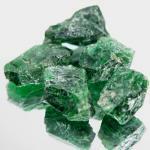 Emerald is, of course, is the most valuable and popular green gem. Tsavorite garnet and chrome tourmaline also have a rich green color but they are increasingly difficult to find and have appreciated in value as a result. Then, in 1988, rumors of a momentous new green gem from Russia started circulating in the trade. Dealers who saw this material when it first surfaced in Europe raved about the resemblance of its color to that of tsavorite and chrome tourmaline and raved as much about its price: only a fraction of these gems. After the wall fell and dealers began exploring the new possibilities for marketing Russian gems, the rush was on. Chrome diopside has been granted class one export status along with diamond, emerald, and alexandrite. Chrome diopside glows with green. In fact, when its color is less than ideal it tends to be from too much green rather than too little. This is more likely to happen in sizes above three carats: the green can be so dark it can look black. But chrome diopside in small sizes jumps with vivid, fresh green color and sparkles with brilliance. 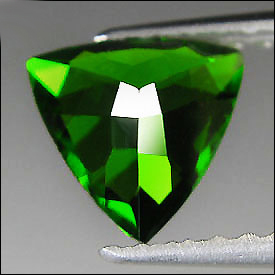 It is the most affordable gemstone with a pure rich green color. 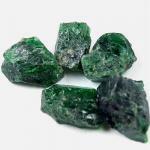 It's availability makes it the perfect green gem for stud earrings and pendants. Chrome diopside has a Mohs hardness of 5.5, similar to opal or tanzanite, so it should be protected in rings that will receive a lot of wear. 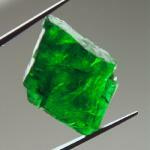 Remove your chrome diopside jewelry before strenuous activity and store it separately from your other gems and jewelry. Clean diopside with mild dish soap: use a toothbrush to scrub behind the stone where dust can collect.